Be the first to share your favorite memory, photo or story of Maurita. This memorial page is dedicated for family, friends and future generations to celebrate the life of their loved one. 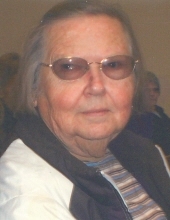 Maurita Ann Grimm, resident of Ponca City, passed away on Friday, January 18, 2019 at her home in Ponca City. She was 82 years old. Maurita was born on February 13, 1936 in Blackwell, Oklahoma to her parents, Lester Vernon Barr and Kathryn Marie (Swisher) Barr. She grew up in Blackwell graduating from Blackwell High School and continuing her education at St. Joseph Nursing program. She worked as a Registered Nurse at St. Joseph Hospital in Ponca City from 1955 to 1965. On September 14, 1957, Maurita married Melvin Ray Grimm in Blackwell. They lived in Ark City, Kansas for a short time before moving to Ponca City. She enjoyed gardening and was a member of the local farmer's market. Maurita was preceded in death by her parents, Lester and Kathryn, daughter, Sally Ann Grimm, husband, Melvin Ray Grimm, sister, Esther Rogers, and brother, Robert Barr. She is survived by her daughters, Connie Sue Guinn of Ponca City and Lorie Raylene Kraus of Okarche, Oklahoma, grandson, Derek Guinn of Pueblo, Colorado, and her granddaughters, Courtney Guinn of Stillwater, Kathryn Kraus of Okarche, and Mikaila Kraus of Okarche, and Sister-in-law Pat Lyons. A graveside ceremony for Maurita will be held on Wednesday, January 23, 2019 at 2:00 pm at Resthaven Memorial Park in Ponca City. Friends and family may pay their respects at Trout Funeral Home on Tuesday, January 22, 2019 from 8:00 am to 8:00 pm. Honorary casket bearers will be: Robert Kraus, Derek Guinn, Greg Lyons, CD Lyons, Monty Hankla, Russell Rogers, Paul Barr, and Chuck Grimm. In lieu of flowers, please consider a memorial donation to Hospice of North Central Oklahoma, 445 Fairview Ave., Ponca City, OK 74601. To send flowers or a remembrance gift to the family of Maurita Ann Grimm, please visit our Tribute Store. "Email Address" would like to share the life celebration of Maurita Ann Grimm. Click on the "link" to go to share a favorite memory or leave a condolence message for the family.